Walk along Iceland’s Golden Circle and explore Thingvellir National Park. Soak in the healing waters of the Blue Lagoon and learn why its mineral-rich properties provide treatment for many skin ailments. In Nuuk, meet a local family and join them for Kaffe Mik, a cozy afternoon get together in their home. To explore the natural beauty of Iceland and Greenland is to sail along sounds and fjords, happening upon tiny seafaring villages where age-old traditions are still a part of every day life. On this unique learning adventure, explore pristine forests and historic roads, see icebergs up close and search for whales, and learn about local history as you explore ancient ruins and meet local residents. Activity note: If you wish to swim in the Blue Lagoon, please remember to pack your bathing suit in your carry-on luggage. Towels will be provided. Slippers, bathrobes and spa treatments are available at an additional cost. Breakfast: At the Northern Light Inn, approx. 15 miles from the airport. On this program, breakfasts will offer a typical European style breakfast buffet with breads, cheeses, cold-cuts, yogurt, fruit, cereals, juice, milk, coffee, tea and water. Please note that water is included in the program cost at all meals. Morning: After breakfast, drive to the Blue Lagoon for a relaxing bath in its mineral-rich, geothermally-heated waters. The Blue Lagoon, located just 40 minutes outside of Reykjavik, was accidentally formed in 1976 during operation at a nearby geothermal power plant. In the years that followed, people began to bathe in the unique water and apply the silica mud to their skin. Those with psoriasis noticed an incredible improvement in their condition. Today the Blue Lagoon is one of Iceland's most popular tourist destinations and features a research and development facility searching for cures for other skin ailments using the mineral-rich water. At the Blue Lagoon, you will learn the history of the volcanic eruption that formed the surrounding landscape 800 years ago, and how the Blue Lagoon itself came to be. Enjoy some free time to bathe in the lagoon. Fully refreshed, coach to Reykjavik to check into your hotel. Lunch: Enjoy a 2-course light lunch at Lava Restaurant at the Blue Lagoon. Afternoon: At 5:00 PM, meet in the hotel lobby for the program orientation. The Group Leader will greet everyone and lead introductions. We will review the program theme, the up-to-date Daily Schedule and any changes, discuss safety guidelines, emergency procedures, roles and responsibilities, and answer any questions you may have. Please be aware that program activities, schedules, and personnel may need to change due to local circumstances. In the event of changes, we will alert you as quickly as possible. Thank you for your understanding. Dinner: Enjoy a three-course set menu welcome dinner inclusive of tea, coffee, water at the hotel. Evening: At leisure. Continue getting to know your fellow participants, settle in, and get a good night’s rest for the day ahead. Breakfast: In the hotel dining room. Morning: This morning you will depart on a full day journey from Reykjavik on this popular route which covers over 185 miles from Reykjavik to central Iceland and back. Stop at Thingvellir National Park, home of Iceland's first parliament, Gullfoss (Golden Waterfall), and the spouting spring area of Geysir, after whom all geysers are named. Lunch: At a local restaurant featuring a two-course set menu. Afternoon: Field trip through the Golden Circle continues, concluding at the program hotel in the late afternoon. Dinner: On your own. This meal has been excluded from the program cost and is on your own to enjoy what you like. The Group Leader will be happy to offer suggestions and give directions. Morning: Following breakfast, enjoy a lecture —“Iceland: Past and Present"—by a local expert before visiting the National Museum of Iceland. This charming museum traces the history of this remote island nation from the Settlement era to the modern day. Lunch: This meal has been excluded from the program cost and is on your own to enjoy what you like. The Group Leader will be happy to offer suggestions and give directions. Afternoon: Enjoy a bit of free time to see and do what interests you most before joining the group to transfer to Keflavik airport for your charter flight to Kangerlussuaq to embark the MV Ocean Diamond. Please refer to the list of Free Time Opportunities provided in your first Information Packet or ask your Group Leader for ideas. Dinner: Aboard the ship. All meals are served in the ship's main dining room. For dinner, you will enjoy a 3-crouse meal and can choose from one of the three chef-prepared entrées. Coffee, tea and water are included in all meals about the ship. Evening: At leisure. Evenings on board the Ocean Diamond typically include a presentation or concert by the ship's expedition team. Morning: Enjoy the Arctic summer and admire the contrast between majestic icebergs and the riot of colors ashore. 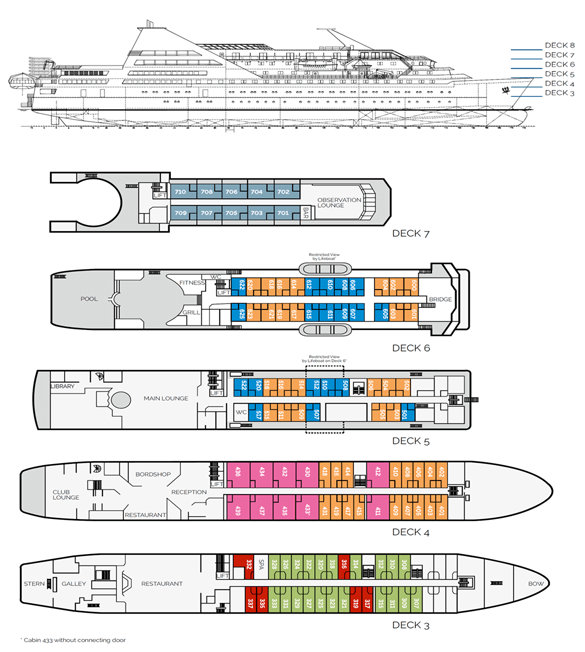 Join your Group Leader for an onboard presentation. Afternoon: Afternoon at leisure to enjoy the ship's amenities and activities. Morning: This morning the ship will call in Uummannaq. Traditionally a hunting and fishing village, and also home to a canning factory and marble quarry, Uummannaq is the 11th largest town in Greenland with a population of just over 1200 people. Visit the town's museum which tells fantastic stories from the region. Particularly interesting is the museum’s exhibition of Alfred Wegener’s expedition on a propeller-driven sled on the Ice Sheet. Wegener became world-famous due to his theory of continental drift. His aim was to build a scientific station in the middle of the Ice Sheet. The museum also houses copies of the famous Qilaktisog mummies, which were discovered in this area in 1972. Afternoon: At leisure to explore the small town or to enjoy the ship's amenities. Morning: In the morning the ship will sail to the Eqip Glacier. Situated approximately 100km north of Ilulissat, Eqip Sermia Glacier is one of the only places is Greenland where you can sail so close to a calving glacier. Afternoon: The Ilulissat Ice Fjord is the mouth of Sermeq Kujalleq, one of the few glaciers in Greenland that reaches the sea. It is also one of the most active glaciers in the world. As an outstanding example of the last ice age of the Quaternary Period, and for what it allows us to understand about our planet's climate, it was designate a World Heritage Site by UNESCO. Experience an unforgettable cruise to the mouth of the Ilulisaat Ice Fjord, where an underwater moraine (collection of glacial debris) catches many of the large icebergs creating a 'bottle-neck.' The only way for icebergs to cross the moraine is by pressure from behind. You'll see firsthand why Ilulissat means “icebergs” in Greenlandic. Evening: Enjoy live entertainment provided by your Icelandic guides. Morning: Originally founded by the Danes as a trading post in 1741, Ilulissat is Greenland's third largest town, with over 4,500 inhabitants. Enjoy a walking excursion along the harbor, to the 18th-century Zion Church, and on to the town's museum. Afternoon: Afternoon at leisure to enjoy the ship's amenities and activities. Join your Group Leader for an onboard presentation. Morning: At sea. Free time to relax and take in the arctic scenery. Afternoon: Nuuk is the capital of Greenland and its oldest town. Founded in 1728 by Danish-Norwegian missionary Hans Egede, Nuuk combines Arctic traditions and European urbanity. With around 16,000 inhabitants, Nuuk is considered as a bustling metropolis compared to the rest of Greenland’s cities and settlements. This morning's coach excursion includes a walk around the old city centre and a visit to the new suburban area of modern architecture. Cap of the morning with a visit to the National Museum of Greenland which exhibits 500 year old Inuit-mummies discovered in Qilakitsoq 40 years ago. Following the museum visit, coach to the small Inuk Hostel to learn about local hunting traditions and are invited to sample a variety of Greenlandic specialties. Meat from marine mammals, game, birds and fish has been the main ingredient in Greenlandic food for generations. The tasting will depend on what has been caught; a variety of fish, muskox, seal amongst other delicacies are staples of the Greenlander diet. Morning: The Greenland Sea is home to numerous seals, walruses and whales. Keep your eyes open as we sail along the island’s scenic west coast. Join your Group Leader for an onboard presentation. Afternoon: This morning, embark boats to Ikkafjord to see unique submarine Ikaite - crystalized calcium carbonate - columns. This mineral is considered rare, though this is likely due to the difficulty in preserving specimens. The towers are created by groundwater, rich in carbonate, seeping into the floor of the calcium-rich fjord. Morning: The small settlement Qassiarsuk boasts some of the most interesting ruins from the Norse period of Greenland history. Erik the Red settled here after he had been outlawed from Iceland. He named the new land "green land" because the region around Qassiarsuk is characterized by inviting fjord landscapes and green, fertile valleys. See the ruins of the first Christian Church in Greenland and visit the reconstructions of a Viking longhouse. The Greenland ice cap produces 250 million tons of icebergs each summer and their final journey begins when they break off from glaciers and plunge directly into crystal-clear fjords. Near Narsarsuaq sail through the Qoroq Ice Fjord in local boats, weaving through hundreds of icebergs with a mesmerizing view of the Qoroq glacier off in the distance. Cruise in between the icebergs and sail into the fiord to see the glacier in the distance. Here the captain will cut the engine to enjoy the arctic scenery and the silence. Afternoon: Free time for independent exploration. 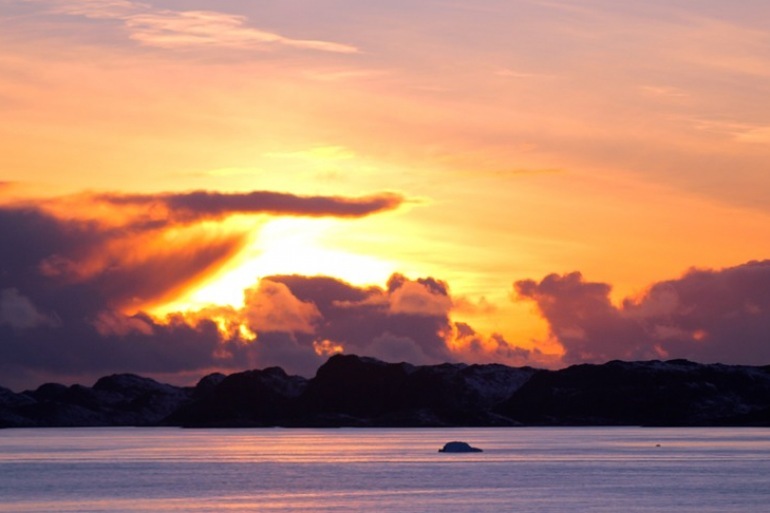 Morning: Prince Christian Sound, near the southernmost tip of Greenland, separates the mainland with the Sangmissoq (Christian IV Island) and other islands of the Cape Farewell Archipelago. It is around 60 miles long and narrow - sometimes only 1500 feet wide, and there is only one settlement along this sound - Aappilattoq (population 132). Cruising through Prince Christian Sound offers beautiful scenery including glaciers, icebergs and steep mountains often more than 4000 feet in height. Afternoon: Continue cruising through Prince Christian Sound. Morning: Sail across the Denmark Strait towards Iceland, following a maritime route used by Norse settlers more than 900 years ago. While en route, attend fascinating presentations by our expedition team. Or just relax and watch whales, dolphins and seabirds from the deck of your cabin. Activity note: Zodiac excursions are dependent on favorable weather conditions. Morning: Enjoy a panoramic coach exploration around Heimaey Island. See the effects of the volcanic eruption of 1973: half-buried houses and the volcanic crater. It’s a unique and fascinating landscape with diverse birdlife. The excursion ends at the volcanic center. This unique museum tells the story of the Heimaey volcanic eruption in 1973, the Surtsey Island in 1963 and the geology of the Vestmannaeyjar Islands. Afternoon: Travel by Zodiac around Heimaey Island for a different perspective of this stunning locale. Be on the look out for caves, birdlife and hopefully whales. Evening: At leisure. Prepare belongings for tomorrow's disembarkation and departure. Morning: Ocean Diamond is scheduled to arrive in Reykjavik at 8:00 AM. Upon disembarkation, enjoy a panoramic coach excursion of Reykjavik. See historic Höfði House - sight of the 1986 meeting between Reagan and Gorbachev that precipitated the end of the Cold War. Visit the Perlan, one of Reykjavik's most recognized landmarks, and also the city's hot water storage facility that has a deck providing a 360° vista of Iceland's capital city. Coach by Lake Tjornin, a small lake in downtown Reykjavik and teeming with birdlife, as well as the Parliament House and City Hall, worth a visit for its large topographic map of Iceland. Enjoy some additional free time in Reykjavik. Make sure to pop into the stunning Harpa Music Hall. This concludes our program. Afternoon: Transfer to the Keflavík International Airport (KEF) for late afternoon flights returning to North America. Group flights are currently scheduled to depart at 5:00 PM. If you are arranging your own flights, we recommend coordinating your flights so they coincide with the group departure. If you are returning home, safe travels. If you are staying on independently, have a wonderful time. If you are transferring to another Road Scholar program, detailed instructions are included in your Information Packet for that program. We hope you enjoy Road Scholar learning adventures and look forward to having you on rewarding programs in the future. Thanks to two stabilizers that significantly reduce roll and an ice-strengthened hull (ice class 1D), the super yacht OCEAN DIAMOND is the ideal ship for expeditions in the Arctic region. Due to the ship’s compact size, we can take passengers to places off the traditional cruise routes to experience all the highlights of both Iceland and Greenland. With a maximum of 199 passengers, the OCEAN DIAMOND features a range of modern onboard amenities and is staffed with outstanding officers and crew, as well as bilingual expedition leaders and guides. The 107 cabins and suites, all of them elegantly designed, offer modern amenities and exterior views. The ship’s own Zodiacs are available for shore excursions. After a busy day of exploration, passengers can browse books or DVDs in the well-stocked Polar library or enjoy views of the spectacular Arctic scenery from the panorama salon. Settle in with exceptional service and stunning views of the urban landscape, sea or glaciers at this sleek hotel just a ten-minute walk from the heart of the city. With a history of hospitality that dates back nearly 50 years, the Radisson Blu Saga Hotel is an iconic Icelandic accommodation. Its modern, stylish spaces and amenities still embrace timeless traditions of high quality and impeccable service. Inga was born in Reykjavik and earned her bachelor’s degree in German and English and her master’s in management and environmental travel. She has been a licensed travel leader and naturalist for the past 20 years in Iceland and abroad — in Ecuador, Madagascar, China, Myanmar, India and New Zealand, among others. She‘s given several presentations about conservation and is a member of the Iceland Nature Conservation Association, the Animal Welfare Association of Iceland, Birdlife Iceland and the Friends of Cats Society of Iceland.